(CNS): Thirty-four years ago a telegramme brought Hyacinth Downer the news that she had got the job she applied for teaching on Cayman Brac. And today, having taught some 1,300 Brac students, both from the high school and the community college, lessons in accounting, typing, commerce and office practice, she is finally retiring from what she calls “the best profession”. Past students at the Cayman Brac High School (now the Layman E. Scott Sr High School) include Deputy Premier Juliana O’Connor Connolly, Chief Officer in the education ministry Mary Rodrigues and many accountants who now work on Grand Cayman. PTA President James Tibbetts, who was a student in her first class on the Brac in 1978, called her “a ray of sunshine at the school”. 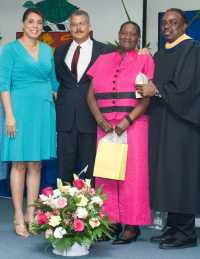 When she applied for the post 34 years ago, Downer was teaching at Kemps Hill Secondary School in Clarendon, Jamaica, having taught in her native country for two years as a trainee teacher and four years as a trained teacher. She was interviewed for the teaching post on the Brac in April 1978 by Linford Pierson, who was then Principal Secretary for the education ministry, and Chief Education Officer Islay Connolly. “That same week the teachers went on strike in Jamaica, so that really worked out well for me,” she joked. The interview went really well, she said, and at the end of it the CEO indicated that she had the job because there were few trained teachers in those subjects at that time. However, in May she received that all-important telegramme to confirm the posting. Photo by James Tibbetts: Vice Principal Hyacinth Downer in pink with (L-R) Chief Officer Mary Rodrigues, Vice Principal Pedro Lazzari and Principal Adrian Jones at the LSHS graduation. Some of my fondest memories of my school days are in Mrs. Downer's class! Thanks Mrs. Downer for your dedication throughout the many years. Only wish my kids had the privilege of being taught by you. All the best. I send my best wishes to a very special lady and teacher! My God continue to guide you in his perfect direction! The Principal and V/Principal do an amazing job at that school! Principals with principles! Our family would like to congratulate you on your milestone of retirement. We will continue to pray for you and your family and wish you enjoyment with your family and Brac family as you transition into the days ahead. Mrs. Islay Connolly and others certainly picked a peach or should I say, a special mango when they chose you for our island. As a new Bracker you will always stand out as a person of integrity, dignity and respect and always be in the eyes of the public like Mrs. Levonne Ryan, Mrs. Georgine Lazzari and others that gave years of their lives to education for our Cayman Brac. It was a pleasure meeting you. We feel that you have always been a true believer in the gospel of our Lord Jesus Christ. You have not just carried yourself in this world as a cultural Christian, not just a person that goes to church because it is the in thing to do but you have lived a life that showed the beautiful person that you are inside. God has truly transformed your life and that is the wonderful person that you have always been to others around you. We thank you for the gift of friendship and look forward to hearing from you from time to time. We feel that you are the person that has walked the walk of St. John Chapter one, verse one. God's peace has truly been your legacy and it has always showed in Cayman Brac and to all others around you. May God richly bless every day of your life as you walk with him in newness of life. The Lord bless you and keep you, the Lord make his face shine upon you and may the Lord lift up his countenance upon you and give you his peace. God bless everything you put your hand to today and always. She brightensa room, can literally alterthe energy before she opens her mouth. Her presence alone is uplifting, her warmth is genuine radiance, and her eye contact feels like a gift. Her compassion and confidence are unshakable. She knows herself well enough to be able to get to know you. She has no pretense about herself, has no need to hide because she lives in truth. She has no need to exalt or deprecate others or herself, and this allows others the freedom to be authentic in her company. She is the kind of woman who makes you check your posture, inside and out. She makes you want to think before you speak, not because you feel judged or compelled to impress her, but simply because she makes you want to be better. Her integrity draws others into the light. Her laughter is contagious. Her hugs feel so good you wonder how you can get another one without appearing needy. When she is happy, you want to celebrate with her. When she is struggling, you want to stand by her side. Because of who you are, I know that God will bless and keep you always. Never lose sight of Him. Have a long and happy retirement. Thank you and enjoy your retirement. Congradulations to a great lady. The school will never be the same without. Enjoy your retirement but don't forget Cayman Brac is your home. Ms. Downer taught me. She's the greatest teacher that I ever had. Many people start teaching and have many bright ideas and then they get tired of teaching but not her. She cared about everyone. Congratulations Mrs. Downer. Enjoy your retirement. A wonderful lady who has touched the hearts of many – she will be sorely missed! First I would like to congratulate Ms. Hyacinth Downer for her dedicated services to the teaching profession, and to also congratulate the Principal on his attire for graduation. Having watched this years High School graduation I must say that there has to be a standard set for an appropriate dress code for Principals and staff. at graduation.